If this is so common, is it really important? YES! This is the chance for our professional team to check your oral health at LEAST twice per year. This is where we review proper home care techniques for you too. Believe it or not, just a few minutes a day can save you COUNTLESS thousands of dollars over your lifetime, improve your aesthetics, keep you teeth and may even help you with your overall health too. Those few minutes will make your hygiene appointment much easier then you can imagine. It is your chance to ask questions and learn valuable tips from our caring health team. Of course we have great care packages for our patients too! So what do you do and why? After we review your medical health, the hygienist will clean your teeth with a spinning cup with a flavored type of pumice or another technique which sprays baking soda from a special device called a prophyjet. Sometimes people have a buildup of a type of calcified plaque (called tarter or calculus) that needs to be removed with other hand instruments or our special device called an ultrasonic scaler. 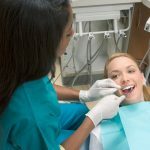 During a typical hygiene (cleaning) appointment, the hygienist may not be able to clean too deeply under your gum line. if you are in need of a more involved periodontal procedure (which is discussed in the next section), you will most likely need to have further gum treatments to bring your tissue into good health. This “Common Cleaning” can be the most important and valuable appointment you will have! Take advantage of the knowledge you gain here. Think of all the trouble, time, aggravation, money, health and your teeth you will save over your lifetime!